We sell all of our items through our shop on Etsy. It is safe, secure and totally awesome. We strive to ship all orders within 48 hours. Shipping is done through U.S. Postal Service. Dolls are usually shipped via Priority Mail. Smaller items usually go First Class to save you postage. Orders with multiple items usually get upgraded to Priority Mail. Oh, and we ship internationally! If you are unsatisfied with your purchase, please convo us on Etsy.com or email us at lwitht@lifewithtigers.com and we will do our best to fix the situation to everybody’s satisfaction. We’re nice folks, really! Most of our hand-sewn items are constructed of wool, flannel, cotton or fleece. Stuffing is polyester fiberfill. Our art prints, greeting and note cards are printed on paper that has at least 30% post-consumer content. Are the dolls child safe? No. Our dolls are often made with buttons, ribbons or other small pieces. Please keep this in mind if you are purchasing a doll for a child. DO NOT put these dolls in a crib! Technically, they are “art dolls” and not toys. We hope they can live on your shelf a while until the little ones are old enough to enjoy them responsibly. You know, when they stop eating buttons. How can I clean the doll or the catnip toy? We recommend hand washing dolls and catnip toys with a hot, soapy washcloth. Please do not put these items in a washing machine or dryer. After it dries, a spritz of liquid catnip makes them as tempting as ever! 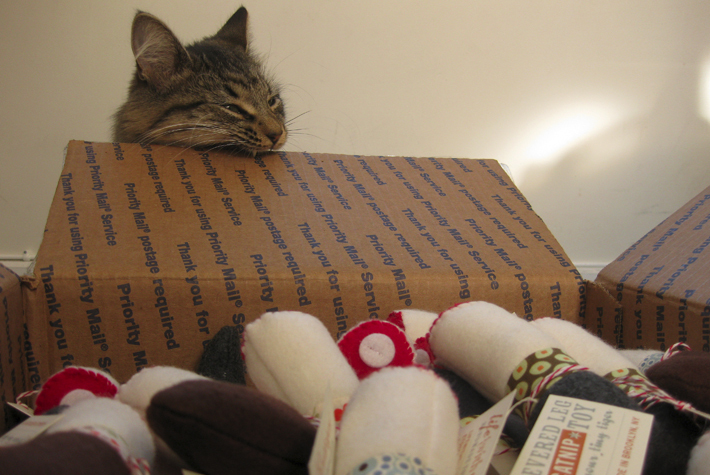 Are the catnip toys safe for my cat? Yes! They are made primarily from durable fleece material. They are double-stitched with polyester thread and stuffed only with fiberfill and organic catnip. They have been kitty tested for years and can last through many attacks, even those funny “rabbit kick” attacks! Can I order a doll that looks like one that has already been sold? Yes, you can. Send us an e-mail with your request and we will do our best to recreate the doll. Please keep in mind that by the very nature of handmade items, it will not be an exact duplicate. We’ll do our best to use fabrics that are similar in texture, color and pattern. Because all of the items in our shop are made by just one pair of hands, wholesale is not possible at this time. However, if you are interested in having some of our items in your retail shop, send us a note! We can work out a custom price for you based on the items and quantities you are interested in. All of the dolls, topiaries, cat toys and cards are original designs and patterns created by Karen Brazell. All images and content © 2015 Karen Brazell.